During the past year I've conducted a bushcraft knife field test covering 15 different knives. You can see the test by clicking HERE. 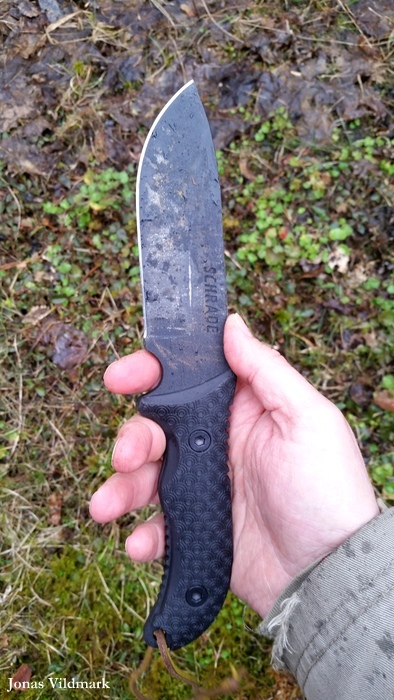 One of the test objects was the Schrade Frontier SCHF36. Tailor Brands LLC was founded back in 1975 by Stewart Taylor and is based in Tennessee USA. The company is managing the knife brands; Schrade, Old Timer, Uncle Henry, Imperial and Smith & Wesson. The 364 g and the 6 mm thick blade makes this knife a real sturdy one. The black rubber scales sandwiches the full tang fixed by two bolts. The structure of the handle is called Textured Black TPE Overlay and enables a very good grip. I've seen examples where the rubber scales is swapped into wooden ones and the black powder paint of the blade is removed to give a more organic look to the knife. I how ever like the black texture and the protection it offers to reduce the corrosion of the carbon 1095 steel. The 136 mm long drop point blade has a hollow grind and the finger out take in front of the finger guard actually works for once. And this finger out take feature is the secret making this fat knife so balanced. 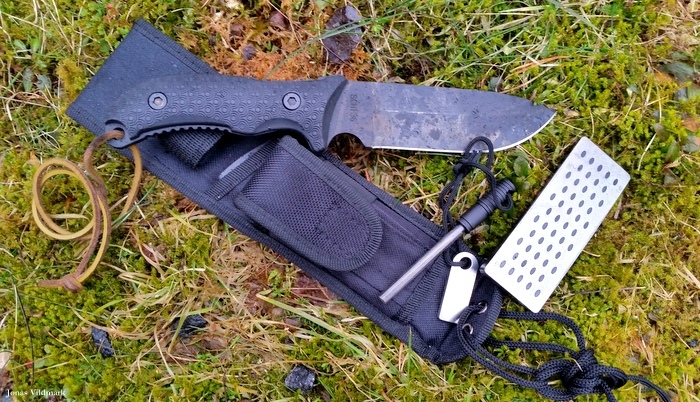 The black nylon sheath is spacious, are using a plastic inlay and comes with a ferro rod and a diamond sharpener stored in the sheath pocket. The sheath design using Velcro makes a flexible sheath that can be removed from the belt without opening the belt bucket. To be honest with you; at first I was a bit skeptical towards this knife. I thought a blade as thick as this combined with a hollow grind couldn't be as versatile. But after holding the knife in my hand and testing it I was surprised how well balanced the SCHF36 is. I think Schrade has managed to create a harmonic rough neck in this knife. The design offers a interesting mixture of; Chopper, Forest Knife, Tactical Knife and Hunting Knife. The knife has managed well both whittling and hunting all though the blood and rain has given the steel some patina, and the sheath is pretty OK even dough it's no beauty. The Frontier SCHF36 didn't manage too well competing with the other 14 test objects of my bushcraft knife field test. But I'm glad I included this odd bird in the test. I wanna give the Frontier SCHF36 a golden star for it's high capacity, versatility and reasonable price tag. I really like this knife. In a upcoming issue of Vapentidningen you'll be able to read more about the SCHF36.